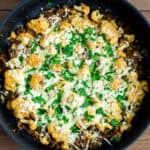 This Italian Ground Beef and Cauliflower Skillet is a family friendly, easy-to-make recipe that’s perfect for busy weeknights. 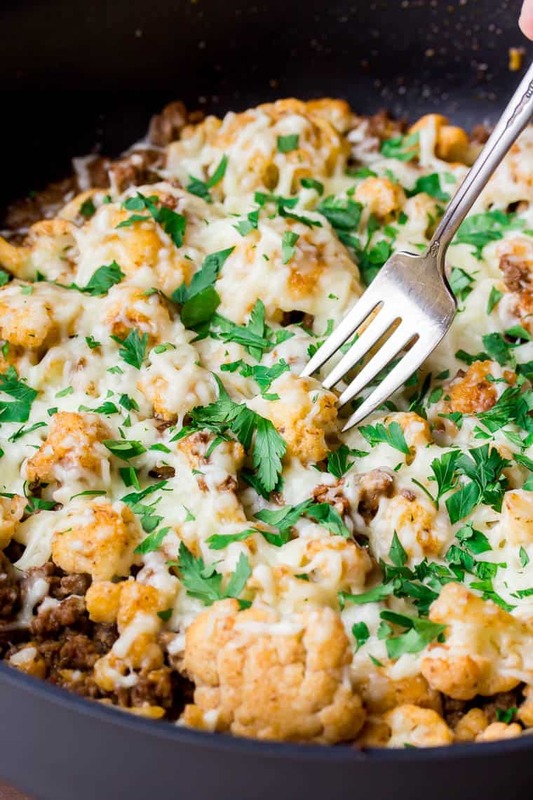 Chunks of cauliflower and ground beef are cooked in a creamy, tomato-based sauce, then topped with plenty of mozzarella cheese and fresh parsley. With only 5 net grams of carbohydrates per serving, this naturally gluten free recipe is perfect for those following a low carb or keto diet. I was inspired to create this recipe when I came across a picture for a skillet creamy pasta and beef recipe in a magazine and thought I could easily make a low carb version. 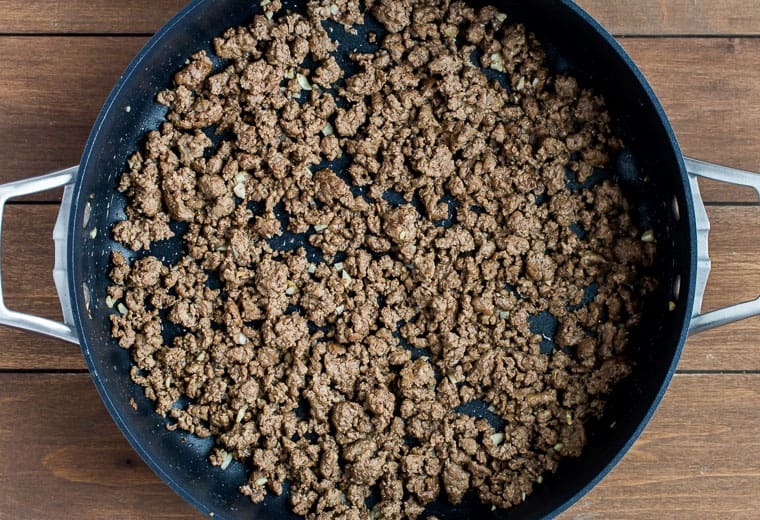 I haven’t made too many skillet ground beef recipes since starting on a keto diet. I’ve been all about the chicken skillet dinners! I actually made this recipe a few different ways before settling on the ingredients and amounts in the recipe card below. I know that eating tomatoes or tomato paste/sauce while following keto is a controversial topic. Personally, I do eat both in small amounts from time to time with no issues. For those who may be concerned – this entire recipes uses only 1 tablespoon of tomato paste and has only 5 net carbohydrates per serving. This is a one-pan recipe that can be made in around 35 minutes. It’s a great family-friendly recipe that’s perfect for busy weeknights. Simple, pantry staple ingredients are used. The result is a flavorful, Italian-inspired meal. This recipe is naturally gluten free, low carb and keto friendly. There are only 5 net carbohydrates per serving. Chop the cauliflower into bite-size florets, mince the garlic, and roughly chop the parsley. Shred the mozzarella cheese. Tip: it is always recommended to shred the cheese yourself, if possible. Pre-shredded bagged cheese contains a starch that doesn’t melt as nicely and will increase the carbohydrates in the recipe. Heat 1 tablespoon of the olive oil in a large, oven proof skillet over medium-high heat. Add the cauliflower and season with a 1/2 teaspoon of the salt and 1/4 teaspoon of the pepper. Cook, stirring frequently, for about 2 minutes, until the cauliflower just starts to brown a little. 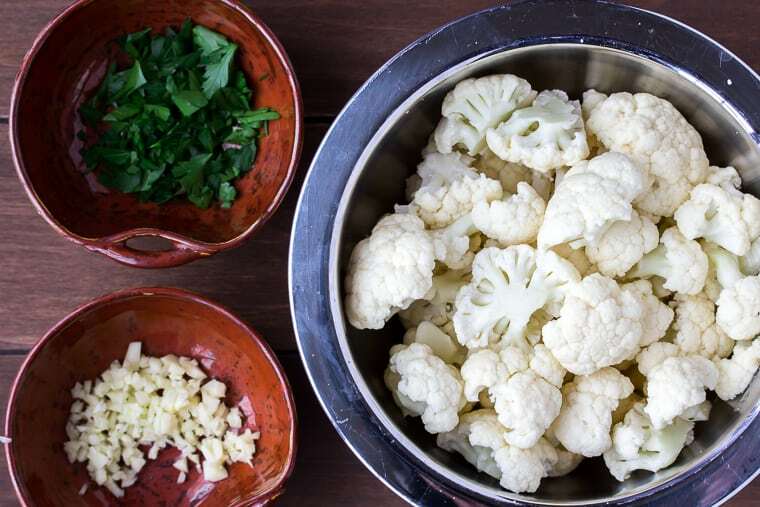 Pour in the water, cover, and cook the cauliflower, stirring occasionally, until it’s just fork-tender – about 3-4 minutes. Remove and set aside. Lower the heat to medium and add the remaining olive oil to the skillet. Add the garlic and cook for just 30 seconds, then add the ground beef. Season with the remaining salt and pepper. Continue to cook, breaking up the beef, until it is no longer pink – about 5-7 minutes. Stir in the tomato paste, heavy cream, and 1/4 cup of the mozzarella cheese. Top with the remaining mozzarella cheese and transfer the skillet to the oven. Cook until the cheese is just melted – about 5 minutes. Top with the parsley and serve hot. It is always recommended to shred the cheese yourself, if possible. Pre-shredded bagged cheese contains a starch that doesn’t melt as nicely and will increase the carbohydrates in the recipe. Store any leftovers in an air-tight container in the refrigerator. Use within 3-4 days. Can you substitute half-and-half or milk for the heavy cream? Yes, just be away that it may alter the nutritional information provided. 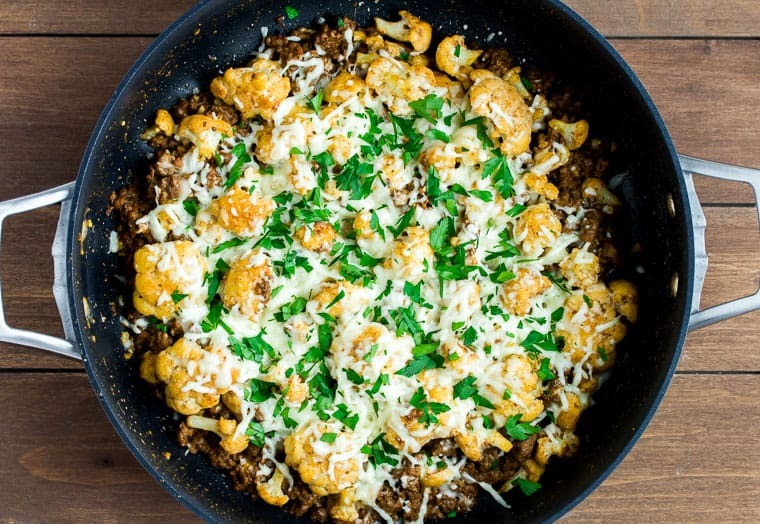 Love this Skillet Italian Ground Beef and Cauliflower Recipe? Follow me on Pinterest, Instagram, and Facebook for more! For more Keto and Low Carb recipes, you can click here to visit the Low Carb section of my Recipe Index or sign up for my Keto and Low Carb Newsletter to get new keto and low carb recipes sent right to your inbox! 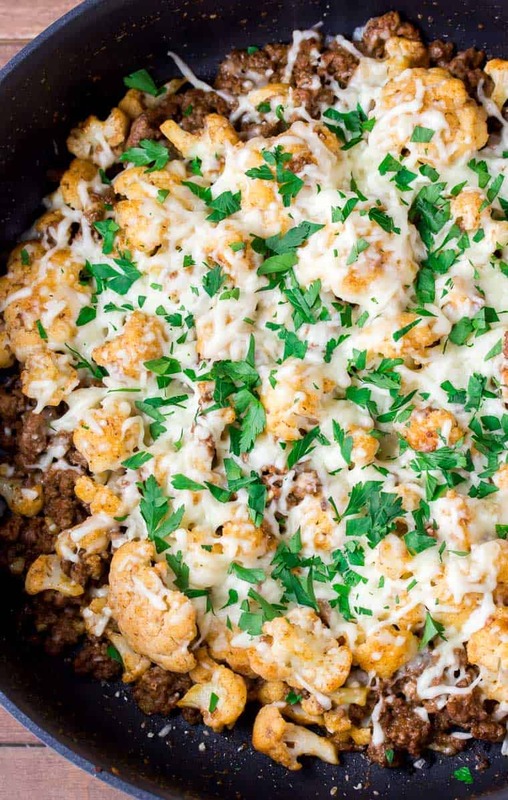 Chunks of cauliflower and ground beef are cooked in a creamy, tomato-based sauce, then topped with plenty of mozzarella cheese and fresh parsley. With only 5 net grams of carbohydrates per serving, this naturally gluten free recipe is perfect for those following a low carb or keto diet. Heat 1 tablespoon of the olive oil in a large, oven proof skillet over medium-high heat. 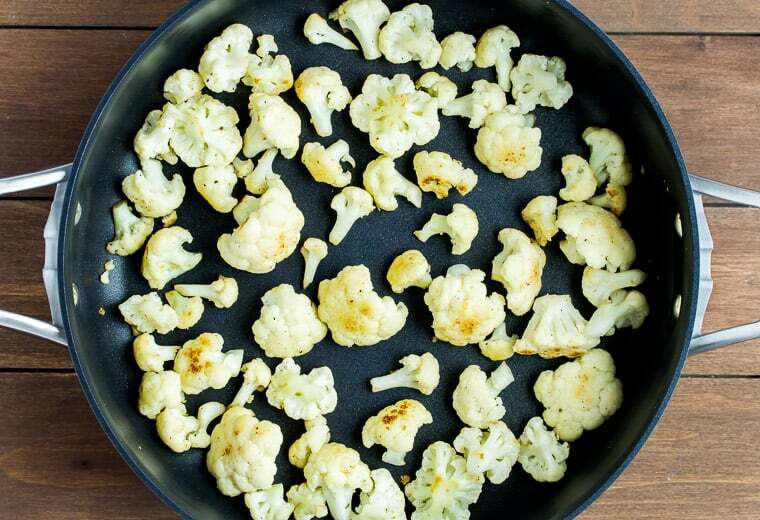 Add the cauliflower and season with a 1/2 teaspoon of the salt and 1/4 teaspoon of the pepper. Cook, stirring frequently, for about 2 minutes, until the cauliflower just starts to brown a little. Pour in the water, cover, and cook the cauliflower, stirring occasionally, until it's just fork-tender - about 3-4 minutes. Remove and set aside. Lower the heat to medium and add the remaining olive oil to the skillet. Add the garlic and cook for just 30 seconds, then add the ground beef. Season with the remaining salt and pepper. Continue to cook, breaking up the beef, until it is no longer pink - about 5-7 minutes. Top with the remaining mozzarella cheese and transfer the skillet to the oven. Cook until the cheese is just melted - about 5 minutes. It is always recommended to shred the cheese yourself, if possible. Pre-shredded bagged cheese contains a starch that doesn't melt as nicely and will increase the carbohydrates in the recipe. Can you substitute half-and-half or milk for the heavy cream. Yes, just be away that it may alter the nutritional information provided. You’re welcome – poached eggs on top sounds like a great idea! Holy yum! 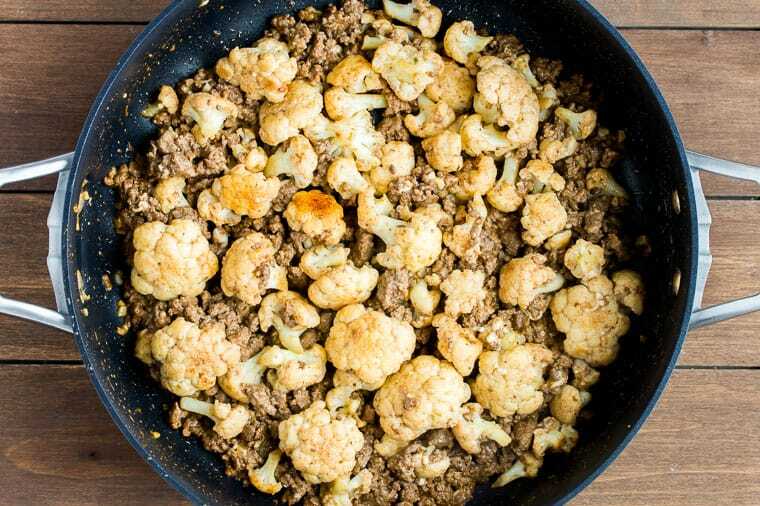 Love pairing cauliflower and beef together and this one sounds like a perfect recipe to try tomorrow. Thanks for sharing this one. Looks like a tasty recipe that my whole family would try! Yum! I’m doing Keto so I am always looking for good pasta substitutes. This recipe almost sounds like a Keto version of Beeferoni! (One of my pre-Keto favs.) Can’t wait to try it out. I love a good creamy beef and pasta recipe, but I don’t like all the calories and carbs of the pasta! This is perfect, I know the whole family will love it! So pleased to have come across a keto version of such a delicious dish! Beef and cauliflower work so well together. Yum.